About five years ago a handful of my closest friends and I moved across the country to plant a church. We had no idea how difficult of a task this would be. The endeavor of starting a church from scratch included more challenges than I had ever imagined. Preparing sermons, building a website, finding a venue to accommodate our gatherings, deciding on core values and a statement of faith, and late night counseling sessions were just a few of my new responsibilities. Virtually overnight my entire life had changed. It was exciting to be gifted with a position that had so much responsibility, but I would soon discover that this all came at a heavy cost. Immediately my friend got me in the car and we drove straight to the emergency room. The whole way there I desperately tried to make my peace with God. I was convinced that I wasn’t going to make it. When we got to the ER the doctors frantically started running all sorts of tests in an attempt to find what was wrong with me, but each of the tests they ran said that I was fine. Eventually one of the doctors gave me a small pill and a cup of water and told me to swallow. Fifteen minutes later I was fine. The pill was for anxiety. I had just had my first panic attack. The leaders from my church were sitting next to me in the ER while my mom and dad were standing by on the phone waiting to see if their son was going to make it. When the news came back that I had simply suffered an anxiety attack I felt relief, but I was also ashamed. The worst part was that despite my best efforts to ensure this embarrassment never happened again, I have continued to battle with anxiety again and again. I can tell you from experience that once you’ve had a full-blown panic attack, it’s as if something inside you comes loose and never really finds its way back into place. Because I’m a pastor I have a whole other list of reasons to be ashamed. I know what the Bible has to say about fear. Trust me, I’ve taken hours to memorize each of the verses. But what do you do when fear grips you in its claws and stops your very breath? Even when you finally realize you’re not actually going to die there is a deeper fear that reaches out and finds you. It’s the fear of “going crazy”. What if the attacks don’t stop? What if they begin to last longer and occur more frequently? 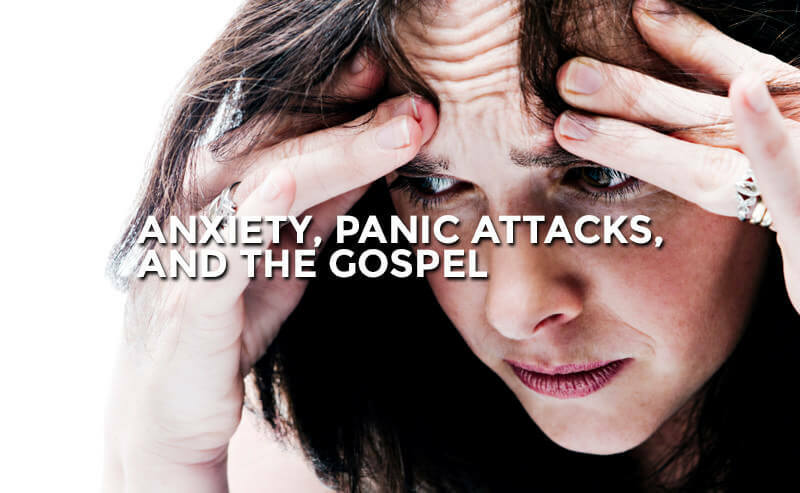 As a pastor I’ve often wondered if a day would eventually come where I can no longer preach because of my anxiety. What if this feeling eventually steals from me the thing I love to do the most? I don’t know how to control my own mind. If it chooses to lose itself what can I do to stop it? Help has come very slowly. I’ve gone through many conventional forms of treatment. I’ve gone to counseling, visited doctors, and even taken medicine. While I would affirm that these things are helpful to treat anxiety, none of them have the power to cure it. Only the gospel can do this. The word gospel literally means good news. Good news is very different from good advice. Good advice is something we need to do, but good news is a declaration of something that has already been done. The gospel is that God himself has come to rescue and renew all of creation (this includes you and I) in and through the work of Jesus Christ on our behalf. Unfortunately, in my desperate attempts to get help all I ever received was good advice. I was never given the good news of the gospel. As a pastor you would think that the gospel is something that I already fully understood, but the truth of the gospel is something that we all need to be reminded of daily. And if I can be completely honest, there are many pastors who don’t understand the gospel at all. If they did they would actually preach it. Instead what most of us hear on Sunday mornings is simply different styles of moralistic therapeutic deism, not the gospel. Sermons usually focus on nothing more than behavioral modification. But sin is never truly conquered by simply changing our outward behaviors, what really needs to change is what we are believing in our hearts. I wouldn’t call my anxiety sin, but I believe it was the direct result of sin. The reason I struggled so much with anxiety was because my heart was trusting in something other than God. Some days it was my reputation that I treasured most, while other days it was my own life. Regardless of what our treasure of choice may be, whenever we choose to put our trust in anything other than God we will be wrought with anxiety, depression, or some type of pain. Saint Augustine famously said that anger, anxiety, worry, and depression are not the root of the problem. They are simply the smoke rising from the altars that we build to our idols. Follow the smoke, and you’ll find the idol that needs to be removed. The tighter we grip our idols the more pain we will experience as God lovingly pulls them from our hands. For a time I thought I suffered from anxiety because my job as a church planter was stressful. That what I needed most was advice on how to schedule my life and say no to unhealthy obligations. Then I thought that perhaps my anxiety was connected to a chemical imbalance and that medical treatment was the only real solution. I now know that my anxiety is a direct result of a sinful heart that by default will always choose to trust and treasure anything but God. And I am eternally grateful for the gospel which is the only thing that has the power to draw my wandering heart back to him.